How Can I Tell My Deck Railing Needs Replacing? 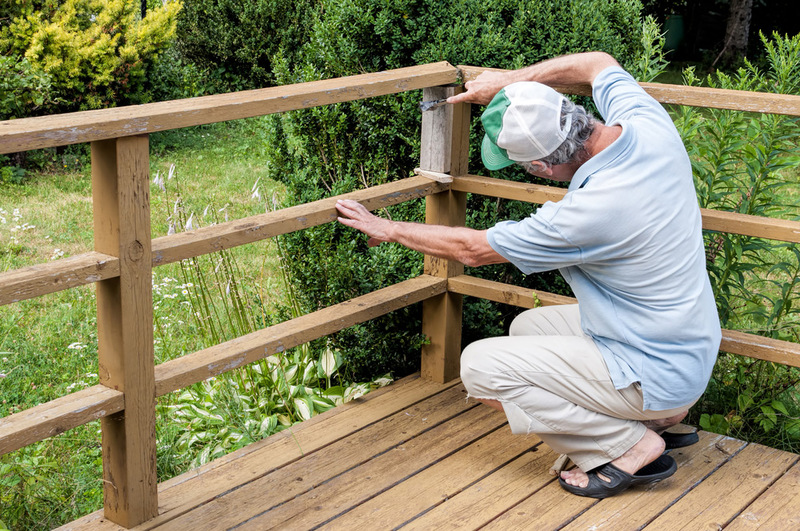 Did you notice your deck railing wobble a bit the last time you went to lean against it? If so, it’s probably made you wonder how to tell when my deck railing needs replacing. Railings can really vary with their lifespan, which is why it can be a little tricky to determine if they need to be repaired or replaced. But, luckily, we’re here to help! Here are a few simple ways to figure out the state of your railings. Like any wooden material, once your railings begin to feel weak or delicate when you grab onto them or lean against them, it could be an indication of wood rot. With enough exposure to the rain, snow, heat, and everything in between, they can start to deteriorate over time. But make sure to test out a few of the railings to figure out if it’s just one or two or more than a few. If it’s more than a few, this is usually the biggest clue that your deck railing needs replacing. Even if you have metal railings, these aren’t immune to damage. Over time, they can also begin to rust and corrode thanks to moisture damage. So look for any signs of corrosion along the nails or screws that connect them to the larger part of the railing design. Any perceptible corrosion can show that your railings are beginning to break down. Warped or splintered areas are also usually bad signs for your railings. When inspecting your deck, look towards the base of the railings. Any discoloured, soft, or warped areas mean your railings are beyond the stage of repair and need to be replaced. This can also indicate a problem with moisture gaining access to the joint between the railings and deck. Any signs of carpenter ants, termites, or dark beetles could mean you have a bigger problem on your hands than merely replacing the railings. If you have noticed pests lingering along the wood, have it inspected and treated right away by an exterminator. These types of pests can quickly get out of hand and impact the structure of your entire deck and even your home. Since railings don’t have a specific lifespan, determining when the deck railings need replacing can be difficult. But that’s where we can help! At Fence Masters, we can take care of all your fence related needs, including repairs or replacements.